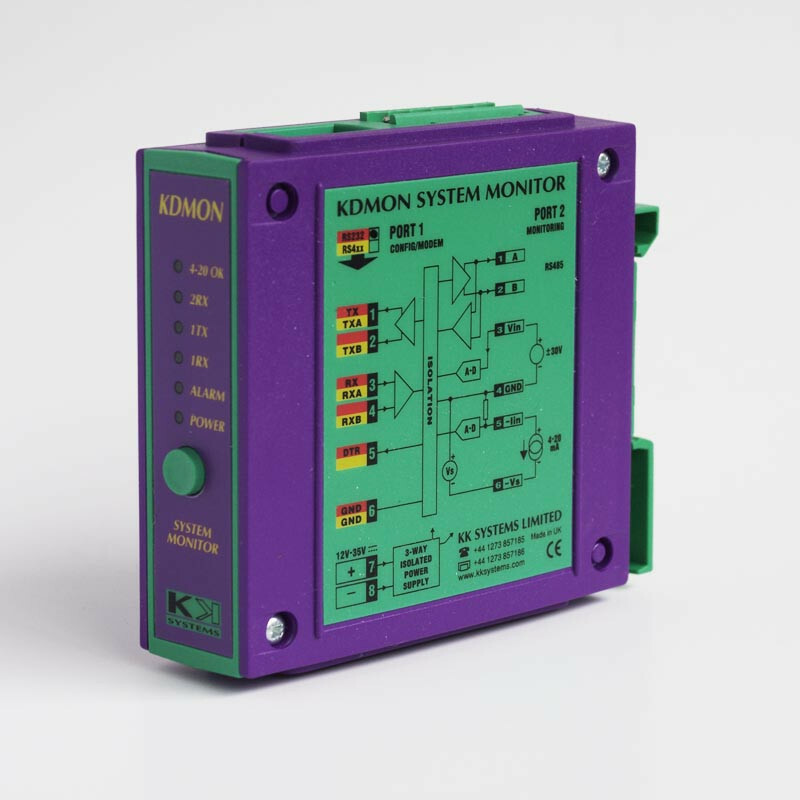 The KDMON is a system monitoring device which can monitor a range of analog parameters and can generate alarms based on them, which are optionally qualified by the day of the week and the time of day. The alarms are transmitted via email, SMS or fax. This product currently has a sixteen week lead time. A wide range of alarm conditions and notification options can be configured via an RS232 configuration port, using a Windows-based configuration program which runs under Windows,XP, Vista and 7, 8 and 10. An external RS232-attached modem is required. The modem type depends on the type of notification configured. We sell the Cinterion (formerly Siemens) MC55i which we have tested with all the KDMON features. Its well known predecessor Siemens TC35 works with all features except email. Another modem which supports all KDMON features is the Cinterion BGS2T. Fax transmission requires a modem which supports Class 1 or Class 2 fax (not Class 2.0). Not all GSM networks support fax however; for example in the UK, 2012, only Vodafone and Virgin support it. The KDMON is powered from a 11-35V DC supply. In most applications, however, with 4-20mA sensors and with the modem powered from the same source, a 24V DC supply is optimal. This product currently has a sixteen week lead time. MODEM-001 - Cinterion MC55i modem. Required for most KDMON applications. MODEM-CLIP - 35mm DIN Rail clip for above. ANT-001 - Delgado L-Quad Antenna. Usable in most good signal areas. 2.5m cable. ANT-002 - Delgado HGMAG Antenna. Higher gain, with a magnetic base. 2.5m cable. ANT-003 - Hirschmann-MCA1890 Antenna. Outdoor, with bracket, 5m cable.